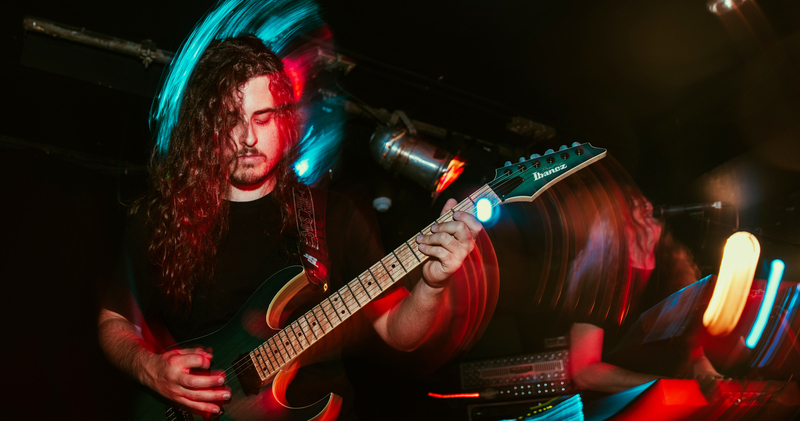 Hailing from Indianapolis, Indiana, The Contortionist are a band whose sound is ever-changing. The past 5 years has seen the band transition from technical metal to all-out progressive rock, and their latest release, 'Clairvoyant', was met with universal acclaim. We caught up with guitarist Robby Baca during their European tour to discuss guitar, gear and going outside of your comfort zone! I’d like to start by welcoming The Contortionist back to London/the UK/Europe! How are you guys feeling this time round? We’re feeling good! This tour has been a big upgrade from the shorter week-and-a-half run that we did last year. We technically weren’t allowed to promote that last run for a number of reasons – but this one’s been promoted well, the shows have done well, and tonight we’re in London! We’re expecting 400 or so people in that room, so it should be a good one! About your latest album, Clairvoyant; it’s been met with huge acclaim. How have you found the reaction to it? It feels good. I feel like I haven’t seen any hate on it online – I don’t look at that stuff too much, but when I do, people are talking about how they’ve connected with it and emotionally attached to it. That’s kinda what we go for. I will say that we’re ready to get writing again – we were actually working on some songs today! Let’s dive straight into some gear questions – it’s gonna get nerdy! Big question: what’s your experience of/opinion on modelling amps? I dove in pretty deep with the Line 6 Helix over the last 2 or 3 years. I’ve used a bit of Kemper and Axe FX in the past but not as much as the Helix. I’ve found that stuff to be just dead on; at the moment I’m using the Helix live, into the FX return of a Boogie as a power amp. I love the sounds that I get out of it. (above) the Line 6 Helix is a pivotal element of Baca’s live rig. So your sound is solely from the Helix with the Mesa acting as a power amp? Yep! I guess I could’ve got a proper power amp and done it that way, but this is what I’m used to doing. Line 6 has been great; our keyboard player uses one too for a bunch of routing tricks and effects. Loads of delays and reverbs, a bit of compression too. All the delays and reverbs that I have on my distortion tones come from the Helix, then most of the clean effects are on my pedalboard. I’ve got an array of pedals for effects. Years ago I might’ve answered that question differently – I was definitely a tone purist, amps only. I think I will eventually move back to all-amp tones with the Helix for effects. Is there a reason why you’ve come to use the Helix as the centrepiece of your rig? I’ve really been trying to perfect my international rig – downsized. At the moment my setup is as compact as it’s ever been; just a handful of pedals, the bare necessities, the Helix and my guitars. When travelling, it saves a bunch of money if you’re not bringing multiple racks and stuff! Do you have any pedals up front, or are they always-on overdrives? Or a combination? Everything’s always on and it’s all MIDI-controlled. The Helix does magic with MIDI. I’m also using some Voodoo Lab stuff. A handful of pedals on the floor, a couple in the rack – it’s as compact as I’ve managed to get it. When travelling, it saves a bunch of money if you’re not bringing multiple racks and stuff! How does your rig differ live compared to in the studio? We used the Helix a bit in the studio, but the guy we did the record with had a handful of amps that we used. A Boogie Mark V I think – he also had a 50W 5150 III that we used for a bunch of dirty tones. Probably the two dopest amps out there – I think anyway! Most of the pedals I have on my board were used on the record as well. There’s a Mesa Boogie Grid Slammer, a killer compressor…a Strymon Timeline for delays too, obviously. There was a handful of reverbs that we used too. Who uses the vibrato effect at the end of Reimagined? Oh yeh, that’s Cam [second guitarist]. I think it’s an MXR Uni-Vibe – great sounding pedal! We all tend to choose our own gear – it’s quite a personal thing. Do you guys ever choose equipment collectively for the sound of the band as a whole? It’s pretty personal. I think if I was listening to Cam, he’d be telling me to ditch the modelling and come to using the amps. Like I said, I’ll probably do more of that in the future – but it just sounds so good and it makes my life easier! Yeh, it’s definitely a personal thing for everyone in the band. We give each other sh*t all the time for dumb pedals that people are using – I definitely don’t have a Uni-Vibe pedal in my rig! You mentioned Cam is more of a die-hard valve advocate – how does his rig compare to yours? Yeh, he uses the same rig in the states as he does in Europe. He brings tons of pedals, the Rocktron Patchmate with all the loops and stuff – which is badass. That’s the rig I used to use, but it’s just too many cables and pedals to travel with. Do you own any particular studio equipment that you’ve found essential to the pre-production process or recording? Personally I’ve only ever owned a handful of interfaces over the years, but I’ve been using the Steinberg UR44 for probably 3 years now – never had any issues with it. It’s actually being used on stage at the moment. JBL monitors and Cubase too. Works well with the Steinberg interface – I love Cubase. It’s about the only DAW I’ve ever properly used. I’ve used Logic a little bit, but once I learned Cubase and how it worked, I didn’t feel like learning another. It’s just easy to use. I see the guys using Logic a lot – I think some of the plugins that come with Logic are super badass. All the keyboard sounds that are just stock, great sounds. Yourself, Cam and Jordan (bassist) all use Ibanez for the most part. How long has that been the case, and what draws you to the Ibanez brand? 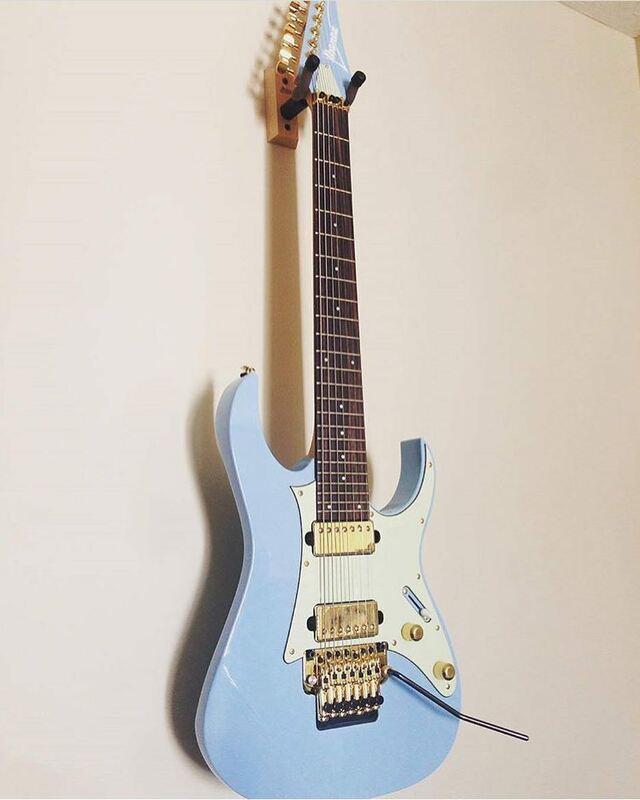 My first real guitar was an Ibanez, back in 2001 or something like that. I think it was like Korn or something – I loved that band, the way they looked, the way their guitars looked. I’ve just been Ibanez my entire life. We’ve been with them since 2010, and they’ve been amazing to us. They’re building Customs for us all the time – the guitars feel great. Like I said, I’ve always played ‘em, so if it’s not broke, don’t fix it right? I think it was like Korn or something – I loved that band, the way they looked, the way their guitars looked. I’ve just been Ibanez my entire life. Have you ever experimented with other stuff? One of my other favourite guitar companies is probably PRS. I’ve had a few over the years, and they’re just their own thing. Nobody else really does that kind of guitar. I love that stuff. I tried a few other brands – the weirder ones like Strandberg, Kiesel and stuff like that. I love that stuff as well but Ibanez has been so good to us. If ever we were to do signature models, they’d be the company we’d want to go with. A couple of stupid questions: do you have any guilty pleasures, gear-wise? Either stuff that you own or would like to own, but you’re ashamed to admit? I was looking at what I think was a 12-string bass the other day. Each string is tripled – like 12-string style, except instead of doubling each string, it’s tripled – it looked absolutely bananas. Probably that thing, ha! What would be your desert island setup? I’ve recently started playing around with the new Mesa Boogie TC100. I absolutely love that amp, it’s one of the best amps I’ve ever played through. Probably that – and my Ibanez RG, Ash body with a Maple fretboard. That’s been a winning combo for me lately. A nice overdrive, though I’m not sure which one I’d go with. And maybe a reverb pedal. Awesome! Now some questions on technique. You guys have all proven yourselves to be proficient musicians; did any of you study music? Well we’re all sort of perpetually studying in a way. There’s tons of guys on YouTube – I don’t know if you’ve ever seen Rick Beato, but he’s this YouTube guy who breaks down what makes great songs so great. He goes into the theory and everything. We’re always pushing each other to learn theory, modes etc. We’re all nerds. Aside from that, I had some theory training in high school and I took some guitar classes, but nothing too wild. As I said, we’re all pretty much perpetually learning. I think Jordan had some music production classes at maybe the Musician’s Institute in California – I can’t exactly remember – some kinda production. He does live sound as a side thing, he’s way into that stuff. Do you guys still practice? Do you stick to any kind of regime? I try to practice a little bit at home, but I don’t really have a regimented routine or anything like that. I try to stay warm, ya know? I like to learn some stuff that I’m into – are you familiar with the band SikTh? We toured with them in Australia, and I’ve always loved their Death of a Dead Day record. I managed to acquire their guitar profiles when I was on tour with them, which is something I’ve always wanted! That’s been something that’s been keeping me practicing lately – learning all those ridiculous riffs. In order to play some of those riffs, you have to figure out a new technique. That’s the kind of stuff I enjoy practicing, stuff that I’ve come to appreciate over the years. Who are your personal playing influences? I’ll fire off a few – like I said, SikTh is a big one. Their riffs have just f*cked my brain up over the years. Between the Buried and Me was another big one when I was younger, though I’ve sort of fallen off of that as I’ve gotten older. Brian Eno and Steven Wilson are big ones – have you heard any of [Steven Wilson’s] newer stuff? His latest record is great. Erm…Meshuggah, obviously! Another one – not quite as big a deal as that stuff but – bands like The 1975. Bands that are in the pop-rock world that are doing something interesting or novel, that’s cool to me. They’re a good example of that kind of thing. Do you ever find yourself in rut in terms of playing or inspiration? If so, do you have any advice for someone who might find themselves in that situation? I guess so, yeh. I feel like a couple of years ago it was a bigger issue for me, but now if I feel like I’m in a rut, I think I’ve got a point where I’m just ready to learn something new. I guess I’d say if anyone who thinks they’re in a rut, they’re probably not in a rut – they’re just ready to learn something new. There’s always something to be learned, especially with music. Whether it’s technical knowledge or just an appreciation for something – just go seek something! I guess I’d say if anyone who thinks they’re in a rut, they’re probably not in a rut – they’re just ready to learn something new. There’s always something to be learned, especially with music. In terms of you and Cam (second guitarist) – would you describe your styles as similar and synchronised, or do you contrast with each other? Yeh, we’re pretty different. I’d say he’s very lead-orientated, whereas I think I’m more into the songwriting stuff. The bigger picture, ya know? He thinks about that stuff too, but I guess to cite how Clairvoyant sounds, he contributed a whole load of lead parts and sections to that record. Do you guys have any side projects or personal pursuits on the go? Yeh, I’ve got a few things that I do. I do some session work on the side, I don’t really put it out there much. I do some bass session work every once in a while. Eric (keyboardist) is working on – are you familiar with Nick Johnston? Guitar player – Eric’s working with him on some stuff which is cool. I have some stuff in the works for a sort-of-solo-project I guess – I’m not sure if it’ll be a solo project, or just a project that’s my brother (Joey Baca, The Contortionist drummer) and I or something. We work pretty well together, so it’d be dumb for us not to do other stuff too. How does the work/life balance work with The Contortionist? Do you guys hold down jobs back home between tours? It is an interesting balance. We don’t work normal jobs as such. Like I said I do some session work every now and then. Over the years I’ve collected massive amounts of gear – selling it every once in a while is a way of supporting myself. For me it’s mostly random session work, which I’m doing more and more of now. I started working at a studio in Indianapolis, doing guitar arrangement stuff for projects that they have in there. There’s a little bit of money to be made from the band obviously, but touring is a hugely expensive thing. There’s enough money in it for us to be able to support ourselves for the most part, but there’s definitely a balance to it. I think people see dudes in bands as being famous, successful or whatever – they assume that those guys make loads of money. I think it’s become more apparent to the general public over the years that there’s not a whole lot of money to be made. With the way that record deals are organised, bands get the shaft really. Hopefully that’s a part of the industry that’ll shift in the future – more in the favour of the musicians. That being said, there are tons of things that bands are doing that are more entrepreneurial. Selling plugins, that sort of thing. As I said before, your music spans several different styles. Over the years you’ve gone through a number of stylistic changes – was that a conscious process or did it come naturally? I think member changes had a lot to do with that. For our first two records, we had a different vocalist. Bringing Mike (vocalist) into the band – his style was way different. Coupled with that, our perpetual seeking of new music and knowledge means that we’re always taking things on different paths. We still love the heavy stuff, but there’s so much more that we’re trying to do too. Do you guys write individually or as a group? Or a combination? Definitely a combination, but mostly individually. Obviously, some broader strokes happen when we come together – arrangement and stuff. Working as a group together isn’t the easiest thing to do, but we’re always trying to get better at it. Your music is very emotive, but there’s also something very calculated about it. Does theory play a part in the writing process? I try not to think about it too much because it can bog me down I think. My philosophy is sort of…if it rocks, just go with it. Sometimes something weird theoretically comes along – a weird mode shift that I didn’t mean to do or something – but like I said, I typically try to not think about it too hard. Just keep enough theory in mind to be able to communicate the idea to somebody else, but keep it to a minimum. Some guys in the band get a little ‘we have to do it this way because A, B and C’ but I try to avoid it if possible! Most of the time, if there’s a bad note, you’ll know it – I feel like guitar players are generally more aware theoretically of what’s going on. You guys did some acoustic/chilled rearrangements of some tracks from your Language album a while back. How did that come about and how did you find playing those songs in that context? It was really cool – we spent like 2 days on those 4 songs, getting them arranged- it was a fun process. We did it in our living room of the house we had at the time. It was great! We’re talking about doing something similar this year – not quite the same, but something special I guess. If you want to know more about The Contortionist, you can check them out on Facebook and Instagram. And if you enjoyed reading this interview, you might want to check out our other industry articles while you’re here!